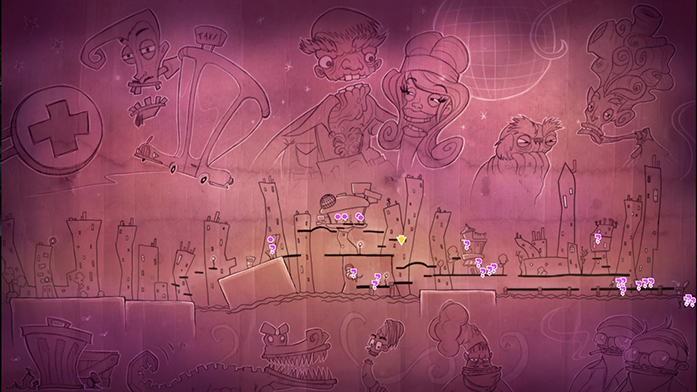 The opening menu screen of Stick it to the Man sets the quality for the entire game. It's stylised, sleek and has the best theme song I've heard for a game for a long time; Octodad possibly being the exception. This four to five hour long puzzle platformer sets a high standard for the genre despite being largely overlooked since it's release. It has it's faults, but it is the best gaming experience I've had this year so far. 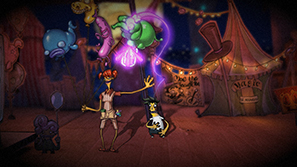 Stick it to the Man is set in a twisted Burton-esque 2d world. In fact, the art style and character design surpasses anything that Burton has made in the last decade. 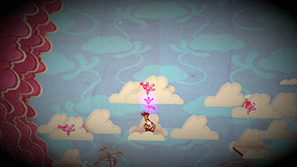 The graphics are crisp and colourful, with a film grain overlay. The design stays at it's high standard throughout it's duration. 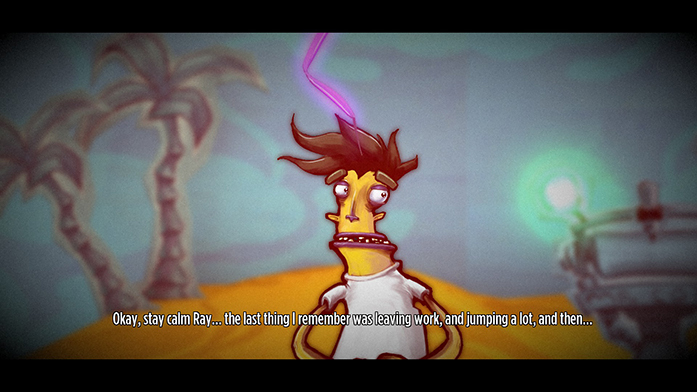 You play as Ray, a hard hat tester. On his way back from work one day he is hit and knocked out by something that had fallen out of an aircraft. 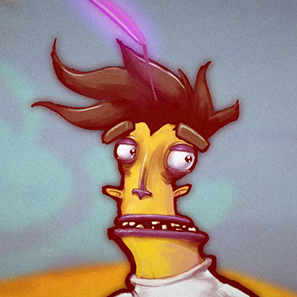 He wakes up in a surreal dream world with a giant pink hand sticking out of his head. This dreamworld chapter serves at a tutorial and teaches the mechanics of the game. You can tear away paper structures to reveal new areas, pick up stickers and after placing them elsewhere they become real and swing up to red pins for easier manoeuvring. 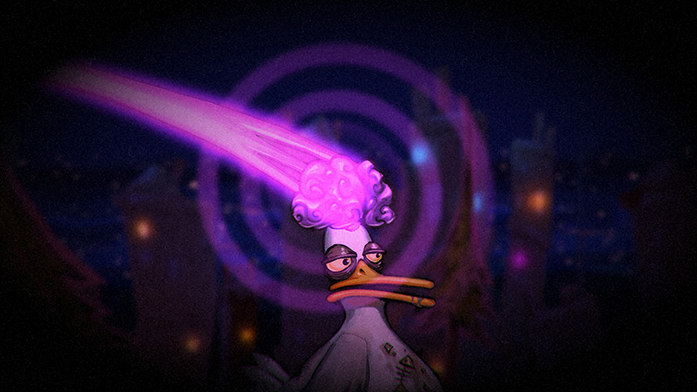 This alien inhabiter also allows you to read people's mind; the most interesting and entertaining mechanic. Upon completing the tutorial the real game begins. You are placed back in reality, in your hometown, with the giant hand still present. There are people milling about the streets, each with their own problems that you can help solve. Some are necessary to proceed but it's well worth completing as many as you can. The writing is exceptional throughout. From start to finish I was laughing out loud at the jokes, scenarios and characters. This is a very difficult thing for a game to achieve but the balance between outright jokes, humourous situations and thoughtful and genuine reflections from characters keep the game fresh throughout it's stay. The ability to read thoughts adds to this considerably. It's not only used for hints for completing tasks; you can also listen for your own curiosity to any live (and sometimes dead) NPC. This gives the characters (a lot of which are recurring time and time again in amazing ways) a hidden depth that you don't really see often in similar games in the genre. You can find out how Ray's girlfriend fell in love with him, Ray's childhood experiences that shaped his future, the motivations for the bad guys and many more. This gives the game such meaning you can get really invested in each character's plight. Listening to the minds of animals also gave me some of the biggest laughs. There are ten chapters in the game and they vary around three types of gameplay. My personal highlight was chapter five; something so unexpected but touching in this kind of game that led me to appreciate and feel connected with the main characters. The laughs were still there too. The only problem with this chapter is that it is not obvious you can do what you need to do to get this narrative. I only found out because I was trying to be attentive to every detail in the game. It was also a good change of pace away from the puzzle solving and poor stealth sections. This leads me to one of two faults in the game. An evil agency is after the alien that's lodged itself inside your head and have sent goons to capture you. They appear in almost every chapter. If they see you they will chase after you and one shot kill you if caught. You can read their minds and occasionally use stickers with either sleep or your face, so that other goons will go after them, but this can be fiddly at times. In the first three quarters of the game these sections, used to separate puzzle areas on the map, are pretty easy and you'll rarely get caught. However, later on in the game these sequences get longer, with more difficult platforming and a lot more goons. I died many times trying to get across some of these which led to some frustration. Luckily you respawn at one of the many checkpoints instantly so it's not too bad, and often there is a shortcut you can open after passing the section so you won't have to repeat. The game didn't really need these sections, or at least it didn't need to make them so awkward to traverse. The second fault is a minor thing, which could be my own fault. In chapter six the puzzling sequence is long, which is fine, but I struggled to achieve the final bit in order to continue. The map, using 'O's for discovered/people to talk to and '?' for undiscovered/objectives yet to be completed, showed all 'O's. I thought I knew what I needed to do (turned out I was correct) but it didn't trigger initially, leaving me wandering the map for a while before youtubing it. Upon returning I tried again and it worked fine. Still, I wish it was clearer that the objective was there. Overall, Stick it to the Man was a wonderful experience. The world has been designed so well it all felt believable. The characters (both main and minor) are fleshed out, interesting and very well voiced; making me really want to help them all out with their problems. The humour is genuinely funny and doesn't grow tiresome at any point. It was a joy going through all the puzzles. They weren't too difficult, but that's because the solutions all made sense (in the twisted way this world works). Too often in adventure games you combine seemingly incompatible items to make something unthinkable, and then it works on something that it shouldn't (I'm looking at you Deponia! ), and the cutscenes and little animations you get for solving them make it all the more rewarding. The story goes in all the right directions too. This was a really big surprise and I hope we see more games in the Stick it to the Man world. This may be the best puzzle solving adventure game in years and I hope more people play it. 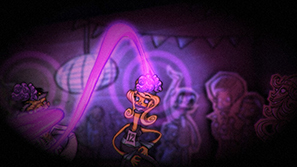 + Clever puzzles that reward you with humourous scenes upon completion. + Genuinely funny from start to finish. + Likeable, fleshed out characters. - Stealth areas are awkward and unnecessary. - Unclear puzzle in chapter six.